The coolest thing about these old cities is the strange way in which the road alignments stay pretty much the same but the stuff occupying the spots has long since changed. Looking at old photos is a favorite pastime of mine. I could stare at them for hours, just analyzing and imagining them. They have a strange familiarity because even though you have never seen the sight for yourself, there is still a strange familiarity to them. This is a sight I see almost daily. 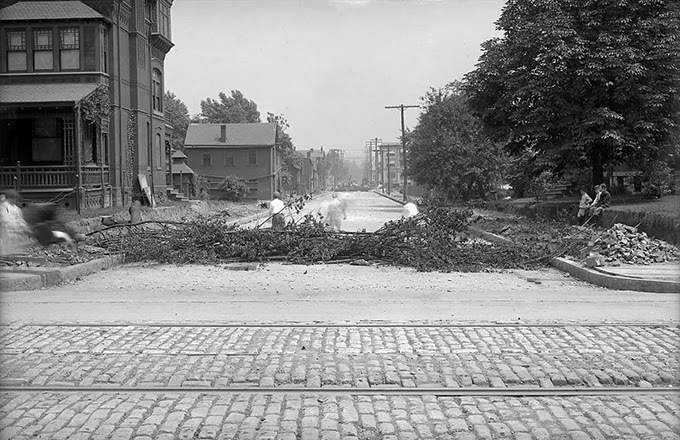 Circa 1920, once again compared to now below. I pieced together these circa 1920 pictures. I accidentally flipped the streets. Both of the middle photos are pictures looking down Semple if my information is correct. Aside from the view of McKee from the left hand side of the mansion on the right, I do not know of any other old photos of McKee at that intersection. This mansion was located exactly where the parking garage and bank is now located. 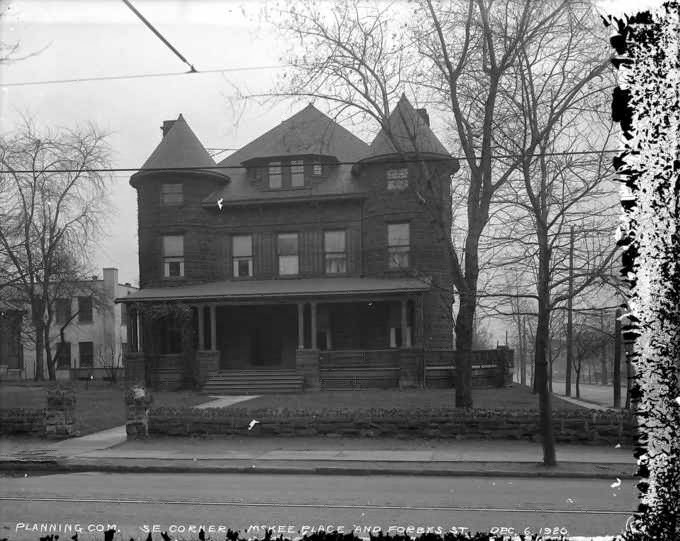 This was the mansion of Mary McKee of the family in which the street one street over was named for. There is one mansion remaining out of this cluster of mansions that once called this immediate area home. This mansion was run down and purchased by Family House, a non-profit that provides an inexpensive place for folks to stay that are seeking out medical care for loved ones at the nearby world class UPMC Presbyterian hospital. They fixed up the old mansion and now it serves a great purpose for the community. This reuse is something we need to study and work to preserve the historical buildings that remain. The two mansions above represented the old money, wealth and affluence that the bulk of Oakland once represented. Now the neighborhood is a largely student and working class place. With this transition, many of these mansions no longer had a use in their form. Family House found a use to benefit the community, but sadly these other architectural works are now gone. 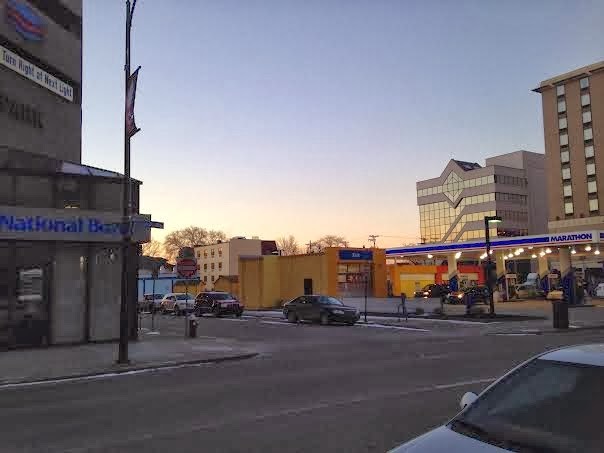 Is the addition of a parking garage, gas station and hotel progress? They are all useful and represent the shifting of our society and car ownership. If you look in these old photos, you can see the primary transportation through the area was by way of trolley. Those tracks actually still remain under several layers of asphalt. The ugly Pittsburgh winter this year actually created a pothole large enough, about 5 inches deep, to see the old tracks that still remain. Watching and studying this old neighborhood, my neighborhood, is really interesting and lots of fun. 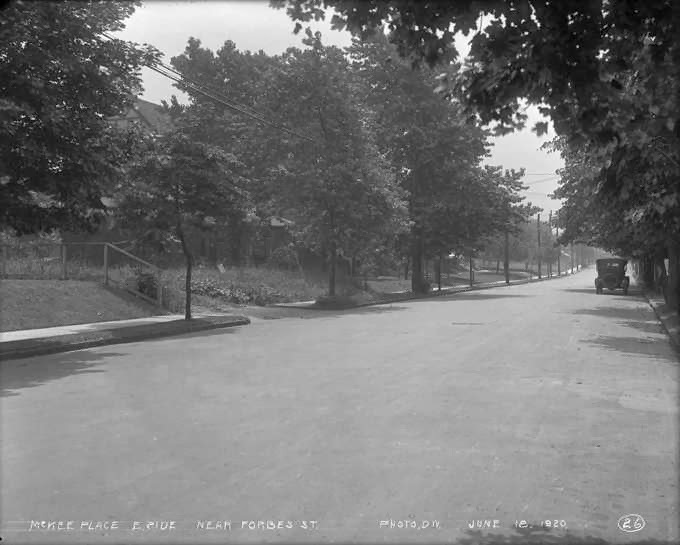 1920 - A view down wooded Semple Street, the street that is now lined up with that beautiful peach colored car wash building, parking garage and lots of concrete. I am not sure what was going on in this picture, but this is Semple with the mansion there on the left. 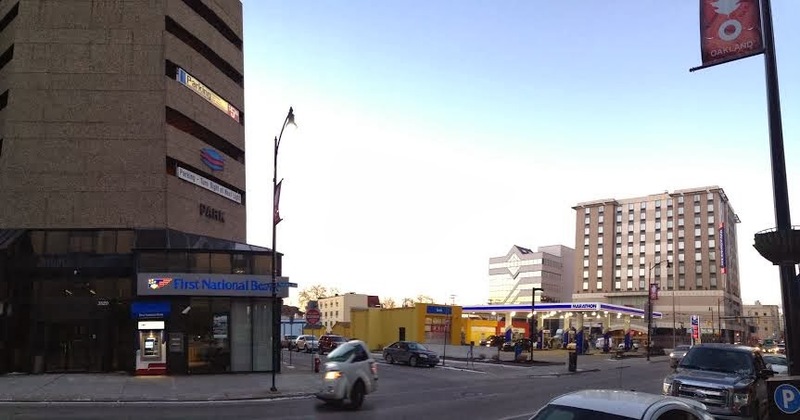 Now the left side of this photo is the location of the parking garage and that large tree is where the gas station's car wash is. Is this progress? I guess. Is is pleasant? No, not really. 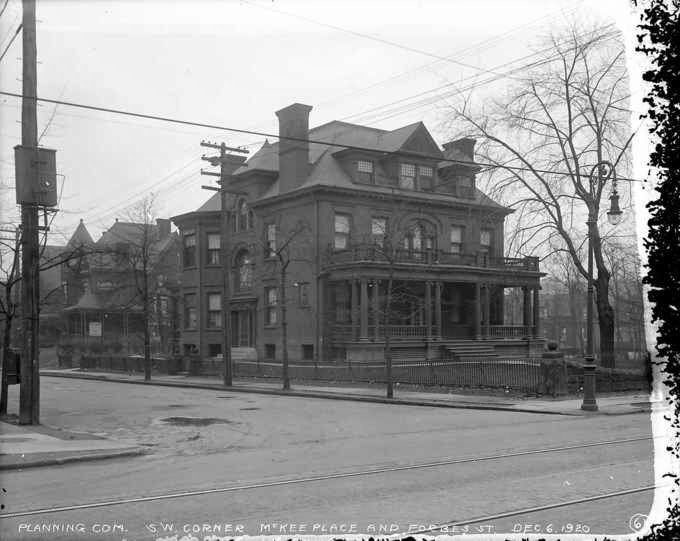 We lost two mansions and a nice wooded street at these two corners and gained a hotel, gas station and parking garage.